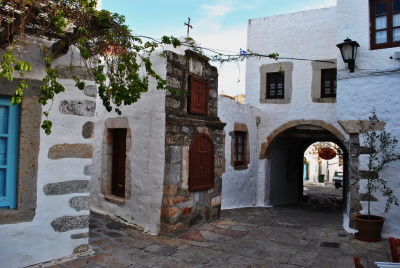 The Historic Centre (Chorá) with the Monastery of Saint John "the Theologian" and the Cave of the Apocalypse on the Island of Pátmos represent a traditional Greek Orthodox pilgrimage centre. Cave of the Apocalypse: a holy place, venerated by both Catholics and Eastern Orthodox as the cave where St. John the Apostle had visions. Patmos Island is reachable by ferries from Rhodes, Mykonos and Samos. From the port of Skala buses travel up the steep winding road to Chora, location of the fortified monastery of St John. Besides the distinctive architecture of the monastery, the frescoes are quite stunning, particularly those within the chapel. On the descent by bus from Chora to Skala I stopped off to visit the cave of the Apocalypse, a detour involving descending and climbing several steep flights of steps. Patmos was a lovely, quaint town with very friendly people. the water there is not potable which I found surprising but the island was a gem. We were on a cruise that stopped there and we spent way too little time. The monastery and cave were very well preserved. I toured both and just being somewhere where St. John had actually been was pretty awe inspiriing. Not enough is known of this small, beautiful and historic island and perhaps that is part of its' immense charm. On a warm and sunny day in October 2004 I was pleased to be offered a pillion ride up the winding road to the top of the hill. Many parts of the monastery are closed to the visitor. What can be seen consists of small rooms and the courtyards between them with lots of intriguing passageways. Close by the entrance is the main church; it is small, atmospheric and rather gloomy with many of the frescoes all but obliterated by centuries of candle smoke. The Treasury museum contains the customary plate, silverware etc and is particularly strong on books, manuscripts, codices and the like. The Old Town is in some ways like a small Arab town with houses showing almost blank walls to the passer-by, though a number of tiny churches are squeezed in amongst the houses. Part way down the hill is the cave in which John is said to have had his divine revelation and to have dictated his vision to his devoted scribes. The cave has been extended to form a small chapel. A notable feature is a circular recess(nowadays rimmed with a silver collar)in the stone wall of the cave, and in this John is said to have laid his saintly head to sleep. 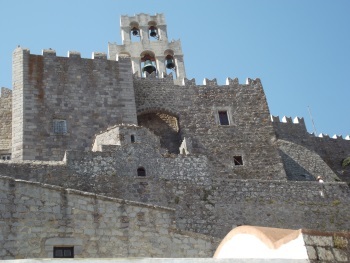 Patmos has many attractions and this site should be of interest not just to WHS spotters. I look forward to another review. 12 Apostles: John of Patmos, the author of the Book of Revelation, was traditionally believed to be the same person as both John, the apostle of Jesus and John the Evangelist, author of the Gospel of John. Some biblical scholars now contend that these were separate individuals. Legends and Folk Myths: Mythology tells of how Patmos existed as an island at the bottom of the sea and how the island emerged from the water by intervention of Zeus. Saints' Caves: Cave of the Apocalypse where St John "the Theologian" received the "Book of Revelation"
Dubbed as another WHS: "Jerusalem of the Aegean" to reflect its New Testament Biblical significance.